Let’s face it – pink has hit the sport’s world in a fast and furious manner. 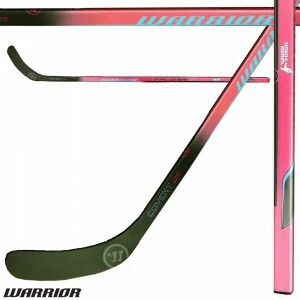 Check out the WARRIOR COVERT PINK GRIP HOCKEY STICKS, now on sale for $129.99 (originally $179.99) at Hockey World. Pink doesn’t mean girly – in this case, it means speedy. The Warrior’s Covert stick offers one of the quickest releases on the ice, and comes in both left-hand and right-hand configurations. It really and truly has the quickest release in all of hockey. When creating the stick, Warrior worked with a leading university to study how hockey sticks actually store and release energy, basically measuring the time a stick takes to launch the puck. This study was conducted for a number of rounds so the engineers at Warrior could fine-tune the stick creating the quickest release in hockey, making it one of the most popular sticks on the market. And it doesn’t hurt that it’s pink. So grab this slick new stick (and get a great deal too) and get ready to score goals. If you buy this stick online (since it’s over $99), it ships for free! Be sure to order ASAP so it can come in time for the holidays. Hockey World also has the best price guarantee, so you can shop easy knowing it’s the best price out there (if not, we’ll beat it by 5%).